Data centres are responsible for well over 2% of the total electricity consumption worldwide and it makes you ask why they are not investing in air intake protection. “Only 29% of data centres appear to have any semblance of a reliable system by which management can measure the relative energy performance”. “data centre operators can incorporate measures to increase energy efficiency, reduce their carbon footprint and improve sustainability”. 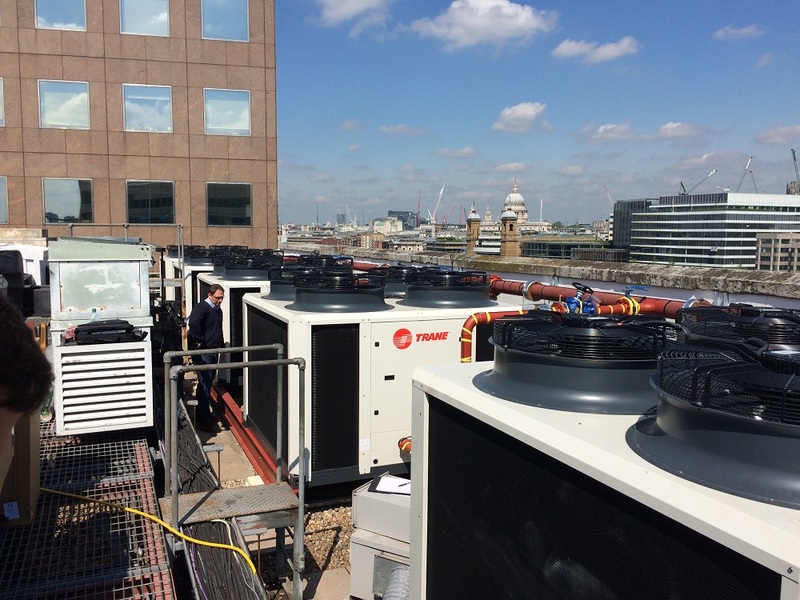 We have visited a many datacentre sites with a view to protecting their cooling plant from airborne debris. Depending upon the load and N+ specification, a datacentre will have many identical units all requiring regular maintenance to proof the site against unforeseen failure. When looking at capital investment on critical plant the major driver must always be energy saving. This can be achieved by using high efficiency motors with infinite control as well as micro fin coils which create a larger surface area for heat dissipation. Unfortunately, in too many cases the cooling plant is then exposed to the debris of the local environment. Coil clogging is a major consequence and routine cleaning and maintenance can easily damage the fins, reducing surface area and increasing energy demand. 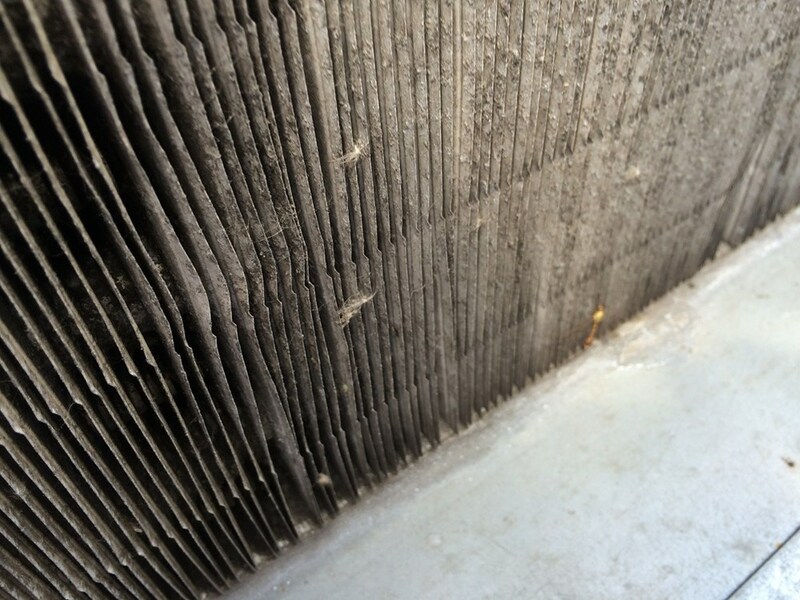 A RABScreen can be used to prevent this contamination by placing an electrostatic layer between the incoming air and the coil fins. High efficiency particle capture allied with low resistance makes the RABScreen a prefect choice for any Datacentre Manager. Until now it has been relatively easy to fit a protective screen onto a coil face. You just need to take a little care and preferably employ a specialist refrigeration engineer to clean and fit. The introduction of the new MagnaMount™ has made installation very simple and so there has never been a better time to talk to us about your cooling plant. Just call 01635 248633 or email info@rabscreen.com for more information. In the global scheme of things HVAC maintenance and improvement of energy efficiency in NHS Estates cooling plant is almost like fighting an elephant with a pin. However, a typical chiller using 100kw of electrical input (e.g. the Airedale Deltachill DCC036DR-06BMS0) will cost approximately £15,000.00 per season to run. This is based upon a cooling season of 90 days and 16 hours per day. If the chiller is not well maintained then efficiencies will drop and electrical usage will increase by as much as 37%. In the above example this would be almost £6,000.00 of wasted HNS funds. It makes you think doesn’t it? Using the 100kW chiller as an example the external filter system would prevent contamination of the coil fins, reduce the labour and environmental cost of cleaning and extend the life of the asset. This is why the new RABScreen is proving a cost effective solution for anyone moving air and could be a massive low cost energy saver for the NHS Estates. RAB Specialist Engineers were recently asked to install external filtration on two TCI (Transtherm Cooling Industries) horizontal coolers for the Frimley Health NHS Foundation Trust. The initial survey concentrated on the measurement and design of a RABScreen air intake protection to protect the downward facing coils. However, upon closer inspection, we saw that the coils had become heavily compacted with debris including pollen, seed and leaves. There is little point in fitting a coil protecting RABScreen when the damage has already been done and we agreed that our installer would clean the coils before fitting the purpose made external air intake protection. A factory order was issued for the new RABScreen and two weeks later they were ready to fit. One of the coolers was cleaned, checked and then had its air intake protection installed. The other was cleaned, checked and found to have a problem with compressor #2 which was tripping out on low pressure due to a leak on the condenser baffle. We returned with two new drier cores to fix the problem and fitted RABScreen to a fully functioning chiller. Discharge pressure dropped from 19.5BAR with fans on full load to only 15BAR with fans regulating. Lower discharge pressure + correct fan operation = £5,000 reduced energy cost for Wexham Park Hospital. If you use a professional to complete your installation you will always be able to go that extra mile for the customer. In this case fully repaired equipment, totally cleaned and protected from further contamination. Lou Holtz would be proud of the RABSE team. We always over deliver. Many commercial and public buildings have poor filtration in the AHU plant and, as a result, you will get a large amount of particulate inside the building. Cleaning the systems is a time consuming and costly task resulting in the poor use of skilled labour. It’s not just old systems that need cleaning. In fact, the newer and more efficient your HVAC system is, the more likely it is to benefit from regular inspection and cleaning because they are much less tolerant of increases in static pressure. While clean coils have always been important, today’s higher-efficiency units require more efficient heat transfer across larger coils to function at their highest capacity. However, they lose much of their effectiveness when forced to run harder due to fin clogging and most condenser coils are exposed to unfiltered outside air containing dust, leaves, seeds, pollen and more. Clogging the coil surface creates an insulation layer between the air and the cooling coil and the compressor will run continuously to compensate for poor temperature transfer. Poor heat transfer results in increased energy consumption. Obviously if there are blockages in the coil the amount of air passing through the system will decrease dramatically. This in turn affects the air conditioner’s ability to cool the air and to compensate, the compressor is running for longer periods. But that is not all. Contaminants attach themselves to the fins of the cooling coil. Over time, they become etched into the surface to provide a secure holding. This eats away at the cooling coil and over time degenerates the cooling coil’s ability to perform efficient heat transfer. The solution for coil corrosion is to remove contaminants through maintenance. The alternative is to replace the cooling coil, which comes at a greater cost than coil maintenance. It is not just the increased energy cost but labour costs increase with the possibility of total equipment failure between service visits. So, when your engineer next services your chiller ask him how much of his time is wasted cleaning debris from the coils. You WILL be surprised at the answer. It’s almost like asking a highly paid chef to do kitchen pot wash. Waste of money. Professional HVAC technicians will tell you that effective cooling coil maintenance provides cost savings in energy consumption. At RABScreen we assert that prevention is far better than the cure. That is why we introduced the unique RABScreen external air intake protection which can protect any air intake on any air movement system. Low airflow resistance and high particulate capture your coils could be kept clean between service visits. Long lasting and inexpensive why not call us for a free survey and recommendation now. Solutions UK is extremely proud to present its highly prestigious and richly deserved Commitment to Excellence profile to RABScreen. Dedicated to improving air quality, RABScreen provide the unique external air filter which can be fitted to any air movement plant to protect existing filters and coils. RABScreen ’ air intake filter screens offer a unique external filtration system to protect your plant from seed, pollen, dust, cottonwood seed and all other airborne debris. As the only UK supplier of such systems, RABScreen was set up in 2012 by Managing Director Richard Betts. Richard discovered the product, which is manufactured in the USA, when helping a customer solve a problem at a major datacentre. In 2012, he gained the right to distribute Air Intake Filter Screens to the whole of Europe and RAB Specialist Engineers was formed in 2013. “I liken it to a mobile phone; no one thought they needed one until they have it, and now people can’t live without them,” commented Richard. “Our air intake protection screens can reduce maintenance cost by up to 75% and increase standard filter life by 60%. Only a slight bit of dirt or debris can affect the efficiency of equipment and use up to 30% more energy. The advanced system works by the polyester core being negatively charged and the polypropylene overlay having a positive charge. Airflow “excites” the engineered mesh and creates an electrostatic charge which attracts debris, which is then held on the polypropylene overlay and can be easily removed. Depending upon the combination of media used, filter efficiency can be as high as 93%. The external weather & UV resistant screen media protects the air movement equipment. Chiller efficiency can be improved by up to 21% and will reduce your environmental impact by lower use of chemicals on cleaning & cooling towers. As a result energy efficiency is increased by up to 30% and ROI can be gained in less than 8 months. When asked to discuss what the future holds for RABScreen , Richard concluded: “We are currently trialling our air intake filter screens in M&S stores and, if it is successful which we are confident it will be, we hope to save energy for the whole retail sector which currently uses a massive 5,800 GWh to power its refrigerated display cabinets. “If you move air you have an application for RABScreen® external air intake protection”. AIRFLOW is the single most critical element in the correct operation of ALL air heating and cooling systems. Yet most systems do not have the correct airflow. As a result compressors overheat, fans blow hot air and heat exchangers at their heart cannot provide the capacity and comfort that their manufacturers built and designed into them. Accurate cooling or heating analysis cannot be performed, system performance cannot be measured, and the servicing or commissioning process will be compromised if AIRFLOW is anything but correct. Essentially that is the end of the story, just ask any HVAC manufacturer. We heat and cool air, humidify it, dehumidify it, clean it, move it, supply it, return it and try to monitor it. ALL of these processes are jeopardised if the designed airflow to the system is restricted. The present economic climate, has caused nationwide cutbacks on staffing and budgets. Fewer staff on site means a reduced capacity for maintenance and servicing. However, the objective of any maintenance team, especially on an emergency call out has not changed. Achieve adequate building cooling or heating. Minimise labour time and maximise efficiencies. Highly qualified engineers are wasting hours on the environmentally unfriendly, chemical cleaning of coil fins instead of fine tuning and balancing the sensitive air handling systems they are trained to maintain. Measuring, monitoring and maintaining correct AIRFLOW should be the first step when servicing equipment. It is the key component for proper equipment operation. Energy consumption is dramatically increased when compressors and fans have to work harder to maintain design output and this means big money is needlessly vanishing into thin air. Also if an expensive compressor needs to be changed and the technician has not fully determined why it failed, the new compressor is sure to fail for the same reasons. In fact, compressors installed by service technicians fail at six to seven times the rate of original equipment. In most regions of the UK, pollen is a major contributor to the fouling of cooling equipment. This, combined with general debris caused by foliage, refuse and other airborne particulates, can have a significant impact upon the day-to-day running of the equipment. During the summer months in particular, coil cleaning, changing of internal air filters and general HVAC maintenance must be carried out more frequently, consuming much of the engineering team’s routine PPM schedule. Humidity control is also an important factor to consider regarding airflow. A lack of humidity control in warm moist environments can lead to mould growth and other moisture-related problems. For example in commercial kitchens and bathing areas high indoor humidity’s can lead to health and comfort issues. Most modern air conditioners dehumidify as they cool and this can be seen as the condense water drains away. However, this dehumidification is incidental to their main job of controlling temperature which is dependent on the free flow of the circulating air. Similarly the correct monitoring of airflow through cooling towers will help to minimise the risk of decaying debris such as insects, seeds and pollen forming a nutrient source for the legionella bacteria. According to the Health and Safety Executive, 90% of outbreaks have their root causes in failures to identify risk and to put in place effective schemes to control and deal with these risks. Unusual weather conditions –particularly dangerous during long high ambient temperatures. It has always been very difficult to add filtration to cooling equipment (water and dry air cooled), small condensers and cooling towers. Until now. RABScreen external ait intake protection now provides a solution to air intake debris, contaminated coils and clogged cooling tower sumps. RABScreen improve efficiency and save money. For details of the external protection provided by RABScreen call 01635 248633 for a free site survey. RABScreen filters can be used wherever you have air movement and, because they are weather resistant, are suitable for both internal and external applications. Just call or email to see how we can save start saving you money.